Choose from Tribeca Tobacco or Subzero Menthol. Halo presents a superb disposable electronic cigarette called the VICE. Each disposable device is comparable to 20 cigarettes. Comes in a pack of 1. E-Liquid made in the USA, award winning flavours. * Perfect for vaping on the go, taking on holiday or for innocuous vaping at special events. The VICE measures 76mm by 10mm by 9mm and is as light as a feather. On the bottom of the device users can view a battery light indicator. Powering the VICE is a 230mAh built-in battery (not rechargeable). The battery power pairs perfectly with the 1.8 ohm atomizer resistance coil the VICE utilizes. The Halo Vice has a 1ml E-Juice capacity that comes prefilled with two nicotine salt flavours options; Tribeca Tobacco and Subzero Menthol. 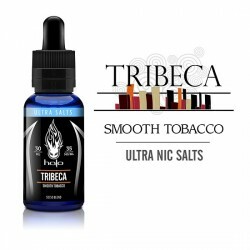 Tribeca has set the industry standard with the flavor of smooth, transcendent tobacco harmoniously blended with the perfect hint of vanilla and caramel to generate an exquisite, sweet finish. 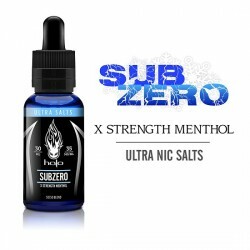 Subzero Menthol exhibits an intense, cool mint effect more powerful than any of our other menthol flavors.